BELLVILLE – A distinguished building sitting near the village’s Central Park is doing its part to give back to the community. The All Souls Unitarian Universalist Church, built in 1894, has a new solar panel installation. It was put into use March 28. The electricity the church has consumed has dropped drastically. The excess goes back onto the electrical grid serving the community. This means people in the area can be receiving the benefit of the church’s project, said trustee Chuck Rhodes. A committee in the church decided to find someone to install the solar panels. Third Sun Solar in Athens did the work. One of two bidders, their proposal was most complete, said Rhodes. Everything since has been “going very well,” he said. The system sits on the east side of the church’s roof. The equipment inside the church is minimal. Rhodes said existing electrical lines are being used. There is a solar inverter in the basement, which converts direct current to alternating current, said Rhodes. The system is so slick that an app where — which Rhodes can use to monitor the solar project — has been installed on his phone. 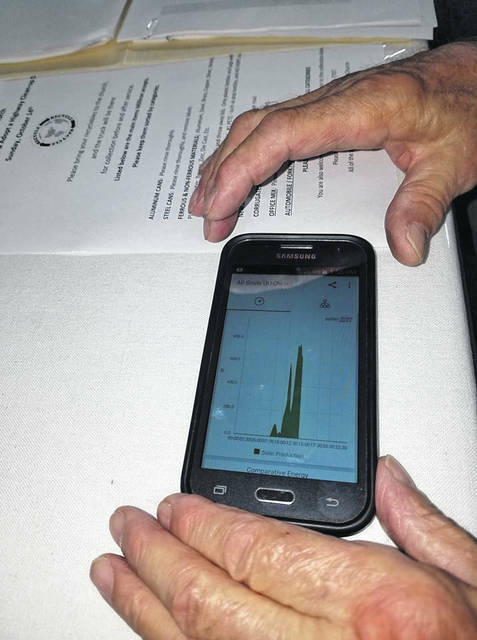 From that app, he can call up charts and graphs, plus various germane details like the current outside temperature His phone told him that on Tuesday, Sept. 25, 536.42 kilowatt hours had been generated for the month. He said there were no electric bills in March and April. That’s a good thing for the environment. It means the savings is equivalent in carbon dioxide savings of planting almost 17 trees. The figures show 6,414,4 pounds in carbon dioxide emissions saved. They also show that from July 17 to August 10, the kilowatt hours used were 38. This compares to 832 for the same period last year. The app on Rhodes’ phone is named “Solar Edge.” It is an app anyone can download to monitor electrical use, said Rhodes. To set up the system, the church had fundraisers. The $18,000 cost has already been covered, said Rhodes. With the dramatic change in electricity consumption figures, the savings in electricity alone could have paid off the system in 16 years, he said. 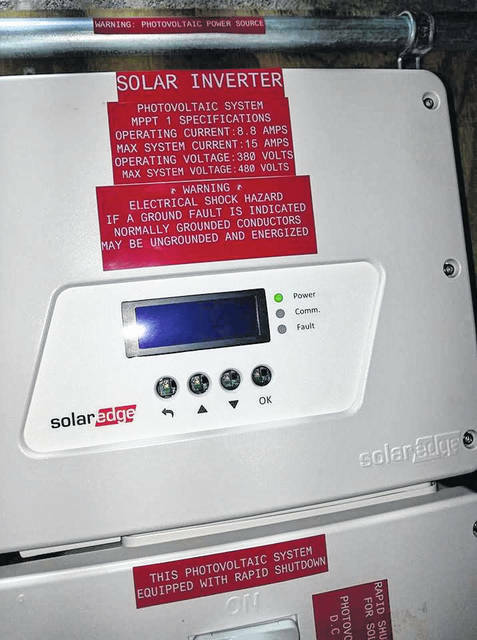 The church has also switched to using only LED lights, another way they are saving money..
Photo by Louise Swartzwalder This is a solar inverter which helps run the solar panel system at All Souls Unitarian Universalist Church in Bellville. The system has made it possible to send electrical power back into the grid serving the area. Photo by Louise Swartzwalder This is an on Chuck Rhodes’ phone that shows graphics detailing electrical use at All Souls Unitarian Universalist Church in Bellville. https://www.thebellvillestar.com/wp-content/uploads/sites/39/2018/10/web1_42678819_2198263146913893_4227370759938375680_n.jpgPhoto by Louise Swartzwalder This is a solar inverter which helps run the solar panel system at All Souls Unitarian Universalist Church in Bellville. The system has made it possible to send electrical power back into the grid serving the area. Photo by Louise Swartzwalder This is an on Chuck Rhodes’ phone that shows graphics detailing electrical use at All Souls Unitarian Universalist Church in Bellville.